Standing 165 meters tall (the height of a 42-storey building), the Singapore Flyer, a giant observation wheel that features brilliant engineering breakthroughs a world apart from the traditional ferries wheel, is one of Asia’s most visible iconic visitor attractions since its completion in 2008. A masterpiece of urban architecture and engineering, Singapore Flyer is must-see and compelling visitor destination in Asia that showcases the mesmerizing cosmopolitan cityscape of the tropical Lion City, and even the surrounding islands of Indonesia and parts of Malaysia in all their glory. Such a modern and high-profile attraction required a state-of-the-art digital signage system to deliver patrons information as they absorbed the sites of Singapore. 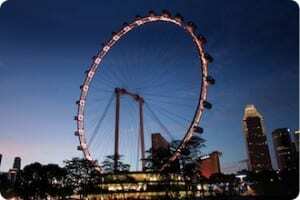 Click the link below to download the full Singapore Flyer case study.